GTK+ 3.2 has been released with two eagerly expected features: experimental support for Wayland and HTML5 "Broadway" backends. Why is this interesting? Well, Wayland, a lightweight display server which is supposed to deliver a better user experience, with smooth graphics and effects, gets closer to becoming default in Ubuntu (Mark Shuttleworth announced that Ubuntu will switch to Wayland in a few releases). It's still unsure when Ubuntu will make the switch to Wayland, but it will definitely be some time after Ubuntu 12.04 LTS. By the way, MeeGo and Fedora are likely to switch to Wayland too. 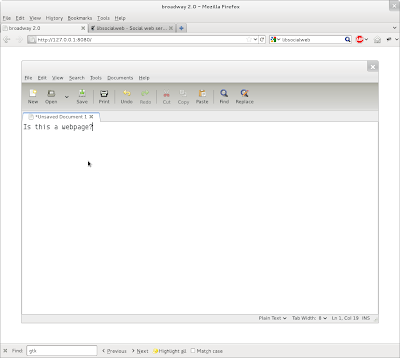 The HTML5 "Broadway" backend allows rendering GTK applications in HTML5-capable browsers. That means that you can run Gedit, GIMP and other applications in a web browser (both local and remotely). Update: And speaking of GTK+ 3.2, the package is just being uploaded to Ubuntu 11.10 Oneiric Ocelot, along with other GNOME 3.2 bits such as Nautilus 3.2.0, etc, however, according to one of the GTK+ developers, this needs to be built with "--enable-x11-backend --enable-broadway-backend" which is not the case for the Oneiric package (but he talks about this in an old post so maybe that's not required anymore).